Sujatha Rajendran has earned Bachelor’s degree in Ayurveda Medicine & Surgery from Dr. MGR Medical University, India after 6 ½ years of formal education covering the study of integrated system of modern medicine and traditional Ayurveda. She had the privilege of working as intern under great traditional family Ayurveda practitioners from India and gained hands on experience in the best Ayurvedic practices that have been used effectively for centuries. She completed advanced course in Varmalogy and gained tremendous insights from Dr. N. Shanmugom, Ph.D., a leading authority on the subject. Sujatha Rajendran is accredited with Ontario Herbalists Association as Registered Herbalist (RH). 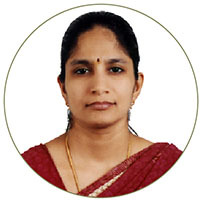 She is also affiliated with Tamil Nadu Board of Indian Medicine as Professional Member . She has 20+ years’ of experience in the field of Ayurveda practicing in Canada, UAE and India.